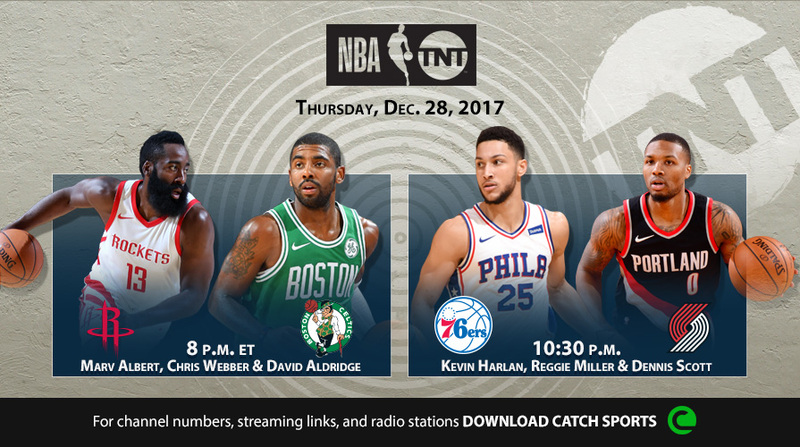 Thursday's NBA on TNT regular season doubleheader coverage will feature some of the league's most explosive and creative playmakers in interconference matchups, beginning with the Boston Celtics and All-Star Kyrie Irving hosting the high-powered Houston Rockets and the league's current leading scorer, James Harden, on Thursday, Dec. 28, at 8 p.m. ET. The TNT telecast will not be available locally in the Houston market. In the nightcap on the network, the young and exciting Philadelphia 76ers with Ben Simmons will visit the Portland Trail Blazers and top scorer Damian Lillard at 10:30 p.m.
• Throughout Thursday's TNT coverage, Kevin Garnett will be joined by a collection of the game's best all-time defenders - Gary Payton, Ben Wallace, Theo Ratliff and Teresa Witherspoon - on Area 21. Select Area 21 segments will air on TNT, with additional content running on Facebook and Twitter. • Marv Albert (play-by-play), Chris Webber (analyst) & David Aldridge (reporter) will call the Rockets vs. Celtics telecast at 8 p.m.
• Kevin Harlan will provide play-by-play for 76ers vs. Blazers, alongside analyst Reggie Miller and reporter Dennis Scott at 10:30 p.m.